Combining quick deployment with the basic mechanism of a folding knife, spring assisted knives are the handiest knives you can ever invest in. They not only facilitate a fast and safe opening action of the blade, but are also quite fun to use (Source). However, considering that there are so many different varieties out there, it can be a bit challenging determining a good quality model from a substandard one. Generally, you want to invest in a spring assisted knife that’s durable, comfortable to hold, requires little effort to open and has a reliable locking mechanism. In this article, we are going to share our top picks along with a brief description of each selection in a bid to help you make a more informed decision. These are the best models you can find on the market. Therefore, it’s a matter of choosing the one that’s most appealing to your needs and budget. 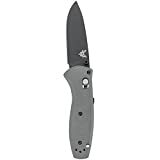 Kershaw has the build and performance of a premium quality spring assisted knife yet comes at quite a standard price. 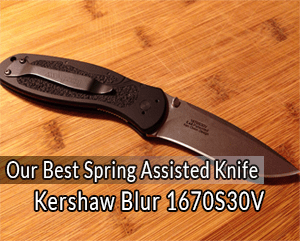 This among other amazing features is what propels it to the top of our list as the best overall spring assisted knife. To start off, the knife feels very solid when holding it. The handle is made of an anodized aluminium which is further reinforced with a Trac Tec grip tape. It’s tough and the rough texture of the Trac-Tec inserts provide a firm grip even in wet conditions. It does not cause any irritations despite its rugged appearance. The handle fits comfortably and securely in the hand. The assisted opening mechanism of this Kershaw knife is spot on. With only a light pull back on the flipper or on the thumbstud, the blade comes out instantly and smoothly. The thumb stud is well shaped and positioned to enable an easy and secure one-handed deployment. Once the blade swings open, it firmly locks into place without any premature closure. There is no play. The liner lock does well to secure the blade when opened. There’s a lockbar that butts up against the backend of the blade keeping it solidly locked for safe handling. You will not experience any unwanted closure. The blade is razor sharp probably the sharpest on this list. It’s slightly curved shape and fine edges provide smooth cutting and slicing making it an ideal multi-purpose knife. The blade is made from S30V steel which is a high-performing, hard steel with great abrasion resistance. Thereby, it’s capable of tacking tough jobs, especially those that require great edge sharpness and stability. To sum it all, the Kershaw Blur 1670S30V is a versatile, multi-purpose knife that’s built to great quality. 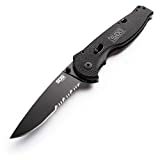 Its light and compact size makes it a great everyday carry knife but considering its superior blade and spring action, it can as well serve as a nice tactical knife. From its design to its construction to the materials used, the 585-2 Mini Barrage boasts of nothing else but strength and toughness. It’s a versatile, highly durable, little knife that’s perfect for all kinds of situation. The knife is ergonomically designed with a water resistant G10 handle that’s quite stiff and strong. It’s well textured with soft and smooth curves, all which combine to deliver a firm grip. You can wield the knife with much ease and being so light and compact, it’s very comfortable even when performing tasks for a prolonged period of time. However, one of the main features that sets the 585-2 Mini Barrage apart from other knives in its class is its AXIS assist and lock mechanism. The springs are strong and very responsive. The blade snaps open quickly and smoothly with just a slight thumb press on the stud. There is no play or any movement of the blade once opened. The blade firmly locks in place making the knife much safer to use. It securely locks in place too when closed, so it’s not going to open while inside your pocket. The blade is smaller than that of the other models on our list but its razor sharp like the Kershaw Blur above. It’s made out of 154CM stainless steel. This is a great quality steel that’s known for its high edge retention, hardness and durability. The best part about this blade is its drop point style. It has a wide, sturdy middle that makes the whole blade solid. Thereby, it will hold up pretty well to tough tasks without tearing or ruining the edge. The tip is equally sharp and strong. It will withstand repeated stabbings with no riding up on the blade or slippages. Generally, the 585-2 Mini Barrage is an impressive premium assisted knife. 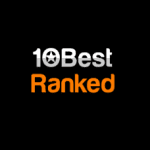 It’s made from top quality materials and has a very sturdy and durable blade. 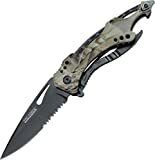 This is a knife designed for tough tasks and to last for a long time. It’s a solid investment. SOG is a company that continues to build its reputation through its great craftsmanship with a tinge of style. They have indeed put a lot of work and care in every design of their Flash line of knives. With an advanced opening and locking mechanism, well-balanced and strong blade, and a simple yet elegant look, the TFSA98-CP does not disappoint either. This versatile knife is designed for use in almost any situation. The blade has a very sharp edge and is sturdy. Like the 585-2 Mini Barrage, it has a drop point style. The middle and back of the blade are hefty, hence it will hold the edge pretty well when handling tough tasks. 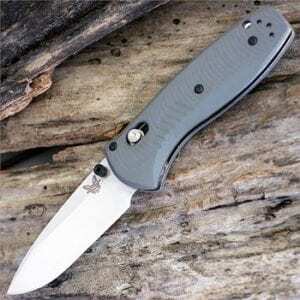 The 3.5 inch AUS-8 steel blade is also partially serrated and the little edges are sharp too. This is another feature to like as the plain-serrated edge combination makes it ideal for cutting through tougher materials. It will make a quick work of any task at hand. The handle fits perfectly in the hand and feels well secured. There is no slippage or bending. The pitted surface provides just enough traction to ensure a firm grip when holding it. Opening the blade is equally fast and smooth. It has a high-tension coil spring that’s highly responsive. It propels the blade out of the handle fast and easily. While deployed, the blade remains solidly locked with no movements or play. The locking mechanism is much stronger and uses a movable bar which securely locks the blade in position when opened. Another commendable feature is the color-coded safety lock on the handle. Once blade is closed and you engage it, it prevents deployment. Therefore, it’s unlikely to unlock and slip out and cut you. Finally, the pocket clip is something else you are going to like about this knife. It’s sturdy, snug and deep. It fits so securely that it won’t easily fall out of the pocket even when in full outright run. Generally, when you look at this TFSA98-CP model, it’s well designed in every aspect and it’s durable. It’s a perfect option for anyone looking for a solid and reliable knife that withstand both home and outdoor use. 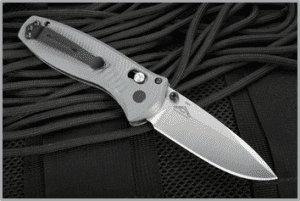 If you are looking for a quality and affordable spring assisted knife with a quick blade deployment mechanism, then this Tac Force TF-705 might just be the right fit for you. The whole knife is very sturdy and well built. It has an aluminium handle with a metal grip that may feel weird at first when holding it. But it’s nicely designed such that you can easily warp your hand around it for a more comfortable and secure grip. The frame is solid, when you twist it in your hands, there is hardly any play. The handle features a screw driver, a glass breaker and a bottle opener on the end. The spring assist deploys the blade faster. However, unlike the other knives, it will need a bit of force. The flick switch is slightly shorter, so it might be somewhat challenging to flick. The blade is pretty sharp out of the box. It’s a sturdy hunk of stainless steel that’s serrated at the base. It feels solid and has no wiggles. The little teeth of the serrated part are extremely sharp. They will devour anything thrown their way. The blade locks securely into place when deployed and remains that way until you close it. It’s equally safe when closed. It does not spring out of its handle. The only downside to this Tac Force model is that despite the handle being ergonomically designed, it’s made of aluminium and a slightly smooth finish, so you might find it hard maintaining a firm grip when you have wet hands. Nonetheless, as long as your hands are dry, then you shouldn’t have nothing to worry about. Overall, it’s a sturdy, sharp and fairly easy to use. 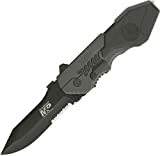 For those looking for an inexpensive spring assisted knife that can hold up for quite some time, this is an ideal option. It’s bang for your buck. The SWMP4LS is another attractive option for anyone looking for a medium-sized spring assisted knife. It’s a well-constructed knife with a pleasing all black modern look. The blade is a strong, highly durable 4034 Black Oxide stainless steel coated with black Teflon and partially serrated at the lower edge. Like the SOG TFSA98-CP and the Tac Force TF-705, the serrated edge has sharp little edges that are ideal for slicing through items that are often harder to cut while using the plain blade. The handle is very solid too and although it tends to fall on the bulky side, it’s ergonomically designed with darker grey rubber inlay. The surface has soft but slightly textured feel. Therefore, it does provide a fairly firm grip and it’s comfortable to hold while using it in a hard or forceful task. Releasing the blade is simple with the help of Smith & Wesson’s M.A.G.I.C assisted opening. It’s quick and highly responsive. Liner lock keeps it secured in place once opened. It produces a satisfactory click when it snaps in place to let you know that the knife is locked open. The best part is that whether you are right or left-handed, you will be able to operate the knife with ease thanks to its ambidextrous thumb knobs. There is also a sliding safety switch integrated in the handle which is engaged when the blade is closed so as to prevent accidental flip out. One area you might have an issue with this Smith & Wesson knife is the pocket clip. It does stick out a lot and can cause damage to anything that it rubs against. Other than that, everything else is fine. The SWMP4LS is a decent spring assisted knife that’s worth every penny. If you are looking for a knife that’s sturdy and a little bit bigger compared to the other models within this category, then the Smith & Wesson SWMP4LS is an option you might want to consider. Having some expertise and a good comprehension of the product you are about to purchase is vital if at all you want to find the best equipment to begin with. Below are some of the most important factors you should evaluate before making your decision. The material used to make the blade is one of the most important things you want to consider when choosing a spring assisted knife or any other type of knife for that matter. The softer the material or blade, the less it will hold an edge. The harder the blade, the better it will hold an edge. However, softer blade are less likely to break compared to harder blades. Two of the most common types of blade materials you are likely to find in the market are stainless steel and high carbon steel. High carbon steels are non-stainless and significantly tougher and sharper than stainless steels. However, they are more prone to corrosion. Stainless steel on the other hand are not as tough as their counterpart above, but they are less prone to corrosion. Plus they are not likely to break easily, except under duress. When it comes to holding edge, they are also much better than high carbon steels. Generally, if you want a tougher, harder, and sharper blade, then you should consider carbon steel blades. But if you want a durable knife that will hold its edge, then check out stainless steel blades. Just like the blade material, you want to look at the type of edge that’s on the blade of the knife you are considering. Here, three common options you will find are plain, serrated or combo edges. Plain edge is probably the most popular blade type in the market. It features a continuous sharp edge that allows you to carry out general tasks that offer minimal resistance. It can cut through most materials, but more ideal for doing smooth push cuts, slicing and as well self-defence. The best part about plain edges is that they are easier to maintain and sharpen. The best blade for cutting through tougher materials are those with serrated edges. They have a series of small, tough, sharp edges that shred and grip materials allowing you to saw through them. The only major downside with this type of edge design is that maintenance can be a little bit burdensome. There are lots of small edges which you will have to sharpen should it begin to dull down which won’t be easy. A combo edge is partly plain and partly serrated, usually at the back of the blade with the plain edge at the front. This is basically a jack of all trades as it lets you utilise the plain edge for easy push cutting and the serrated part for rigorous cutting. So, it’s very versatile and the perhaps the best option between the three because you can perform almost any task with it and it’s not that clumsy like the purely serrated edge knife. However, sharpening and maintaining it might be slightly difficult but to the point of serrated edges. Blade shape is another important consideration as it will also dictate how you maintain and use the knife. Drop point is the most common shape you will find. In this design, the dull end of the blade is nicely dropped down to the tip forming a slight curve. It offers a large cutting edge and the dull end is thick and strong, so it can handle very well tough tasks and keep the edge. It’s ideal for hunting. Clip point is also a common blade shape you will see in spring assisted knives. Here, the dull side runs straight from the handle to halfway the blade length, at which it starts to curve in a crescent shape all the way to the point. This type of blades are sharp and ideal for piercing. They also have an ample cutting edge for slicing. Therefore, here your choice will largely rely on your needs and the type of task you are handling. Nonetheless, drop point are a better option because they are versatile and much tougher. You will have to look at the length or size of the blade too to ensure you don’t get one that’s either too small or too large. Basically, spring assisted knives will vary widely when it comes to length. However, you want to focus on models with blade length that range from three to four inches. This is the medium range and most knives within this range are large and strong enough to handle almost any task but still small enough to be carried with much ease. Anything smaller than that might not be that strong unless you want to use it for small, basic tasks like cutting string or opening boxes. Larger blades on the other hand are more ideal for self-defense. They are bulky, and heavier which it hard to carry them, especially discreetly. No matter how sharp the blade is, it will be difficult to make the cuts you desire when the knife does not sit comfortably your hand. A knife with a poorly designed handle generally means an unpleasant cutting experience. You want to pick a knife with a handle that offers a firm yet comfortable grip. One that’s very solid and will no slip off your hand while using it. A good handle in this case should have a slightly texture surface, be relatively slim and fit comfortably in the hand. The ideal options to consider here would be handles made from G10 or carbon fiber. Nonetheless, as long as it’s solid, comfortable and offers a firm grip, then you are good. You want to make that you also have a reliable and solid locking mechanism, so that it doesn’t accidentally snap shut on your finger and cause some serious injuries. It’s a safety feature that will keep the blade securely locked in place while using it. There are many types of locks that are utilised in different printed assisted knives. However, you are more likely to find either a liner lock mechanism or frame lock. The two mechanisms basically work the same way. The only difference is that in frame lock, one side of the frame slides under the blade once it’s full deployed in order to lock in place. So, it offers an easy one-hand operation. In liner lock, one side of the liner shifts to lock the blade in position while the rest of the handle remains in place. This mechanism is very secure and quite functional. An additional thing you should also consider is a safety lock. This is not always present in most knives, so you want to make sure that the models you consider have it. A safety lock will help keep the blade from opening when closed or when you carry it in your pocket. The final factor you want to look at when evaluating various spring assisted knives is the pocket clip. You will find two major categories in the market, fixed pocket clips and reversible pocket clips. The best option here is the reversible pocket clip, because it keeps the knife vertical for comfort. Also, it rides higher in the pocket than fixed clips, hence facilitate an easy and quick access. Selecting the best spring assisted knife is simple when you know what to look for and you have a bit of background knowledge about the product. The market is filled with all kinds of designs and styles coming in different sizes and prices, so there is something for everyone. The guide we’ve included above can significantly help speed up the selection process and allow you make a more informed information when evaluating various options. However, if you want some ideas or just a good place to start, then we recommend considering any of the five knives we’ve picked.